I love the color of the hardware!!! 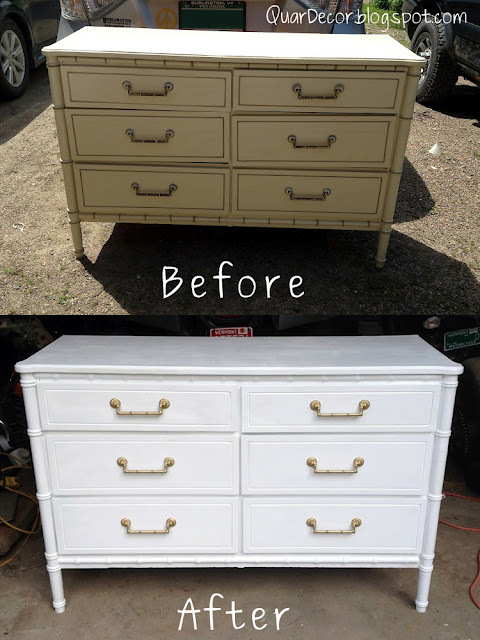 I am going to have try spray painting my next dressers hardware the same color! What brand of paint was it? The dresser is gorgeous! Thanks Peggy! I used Valspar white latex paint for the dresser, and for the hardware I used gold with Krylon "general metallic" gold spray paint! Theresa-- SO funny! I saw this dressed on craigslist (I'm in Addison Co., VT) and was trying hard to find a place for it in our house. Couldn't. *sigh* Then I saw your post on the frugalicious friday blog and thought, hmmm, didn't I just see that very same dresser posted somewhere? Wish I could find a spot for it. I've always loved bamboo, I like the gold handles, and overall, I just like that look. Heck, if we hadn't just redone a bathroom, I might have tried that as a vanity cabinet. Looks great. Good luck with selling it. Haha! Thanks it already sold this week :) That would have looked super awesome as a bathroom vanity, I love that idea! What a gorgeous dresser - classic!!! Congratulations on the sale. Why don't I ever find a free piece like that? :) Really like the simple elegance of the way you brought that dresser back to life. This make over is wonderful, nicely done, it's really beautiful. It looks very classic now but also with a modern touch that makes it look very appealing. Thank you for sharing.